How an Idea, …and an Ad … and Some Italians Got us the Auto Rickshaw!!! After that glorious stroke at midnight in August 1947, following two centuries under the colonial yoke, India finally became free. While citizens reeled under the after-effects of a hurried partition, leaders had a mammoth task at hand. They needed to plan and act towards the development of the new nation—economically and socially—and her people as producers and consumers. “Correcting the disequilibrium” in the economy and an improvement in “the living standards” of the people featured in the objectives for the First Five Year Plan(1951-52 to 1955-56). In a February 1947 session of then Bombay’s legislative assembly, a member raised the inhuman conditions of rickshaw pullers. This discussion set many wheels in motion. Morarji Desai, then Home Minister of Bombay province, suggested that cycle ricks haws be discontinued. Navalmal Kundalmal Firodia, a freedom fighter, saw in this an opportunity to provide low-cost public transport to the country. The image of a three-wheeler “goods carrier” from a trade paper caught his eye and inspiration. He submitted a plan to Desai and was told that if the vehicle was satisfactory from “a technical viewpoint”, it could be permitted under the public conveyance plan. Firodia’s Jaya Hind Industries, set up a joint venture with Bachhraj Trading Corporation (later Bajaj Auto Private Limited), to replicate the vehicle in the image. It was manufactured by Italy’s Piaggio. To better understand the nuances, Firodia bought a scooter and two three-wheeler goods carriers from the Italian company, studying the models and making several modifications to arrive at the final product. Painted in hues of green and yellow, it was a mix of the hand-drawn carriages of the time and the automated two-wheeler. This contraption would soon become commonplace on Indian roads and affix its reliability on the Indian psyche. The industrialist in Firodia had perhaps foreseen how it would enable independent Indians to undertake convenient and affordable trips around the country’s myriad cities and towns. With the approval in the Bombay province, he saw and used another opportunity to popularise his vehicle—the prohibition of cycle rickshaws in Pune. By December 1950, N Keshava Iyengar, the Mayor of Bangalore, approved the licenses of ten auto rickshaws in the capital of the princely state of Mysore. These vehicles “resembled a scooter pulling a passenger cabin attached to its rear”. Iyengar inaugurated the first auto and is even said to have volunteered to take the vehicle’s owners, a Bangalorean man and h is Italian wife, on its maiden journey! While people hailed the autos, the jatka union (hand-drawn cart) in Bangalore and the tongawallahs in Pune were unimpressed; the last-mile connectivity to and from public transport that auto rickshaws provided stood in their way. As did the restrictions from the Monopolies and Restrictive Trade Practices Act, 1969. A coffee-table about Kamalnayan Bajaj, the pioneer of Bajaj Auto, highlights this in the following words. 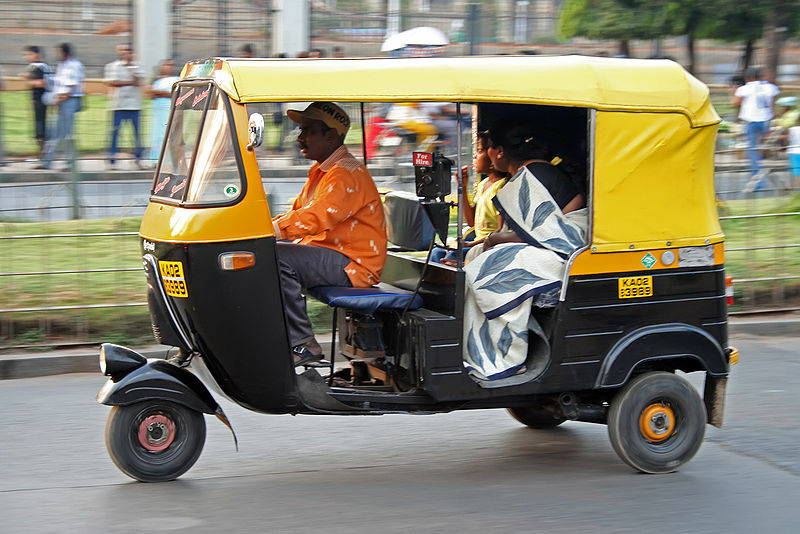 While the Bajajs and Firodias went their separate ways, with the auto rickshaw coming under the Bajaj Group, Bangalore’s ten auto rickshaws grew to 40. 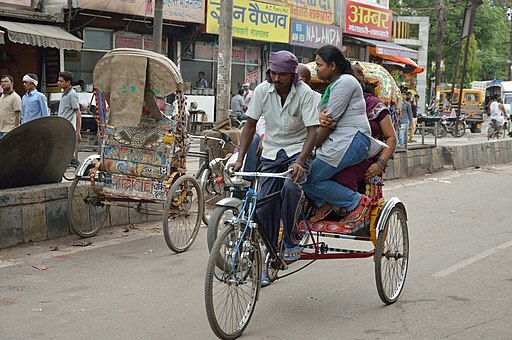 The fact that middle-class Indians did not yet have enough disposable income to own vehicles furthered the popularity of the auto rickshaw, and it became the symbol of affordable urban transport. This was true not only for India, but also for other developing countries. By 1973, Bajaj Auto was exporting three-wheelers to Nigeria, Bangladesh, Australia, Sudan, Bahrain, Hong Kong and Yemen. In the financial year 1977, the company introduced rear engine auto rickshaws and sold 100,000 vehicles. Until 1980, the vehicles were only allowed to carry two passengers at a time. However, this changed in the next two decades, and today, autos can transport as many as can fit themselves on the seats! As per data from EMBARQ, auto rickshaws in tier-2 cities (population between 1 and 4 million) number between 15,000 and 30,000, to more than 50,000 in tier-1 cities (population more than 4 million). The sector also employs an estimated 5 million people! Additionally, the auto rickshaw union is one of the most organised labour groups in the country. They follow the latest trends—from unitedly aping a favourite actor’s haircut to expressing their thoughts on the vehicle. While auto drivers have been criticised for irregularities in the fare system, and their disregard to the safety of passengers, autos remain the quintessential mode of intermediate or even end-to-end transport for an Indian. Taxi aggregators born in India and abroad have take note of this, and as a result, co-opted the vehicle in their business models. Interestingly, Firodia was not just responsible for bringing the three-wheeler goods chassis from Italy and converting it into a passenger vehicle in India, but also coined the term ‘auto-rickshaw’. The word now finds a place in the Oxford Dictionary, and since its introduction in 1949, the auto has not gone off the road.